Last season, Shakhtar secured a golden double, so they will compete for the Super Cup against the domestic league’s second best side. Traditionally, this encounter will give start to the new football season. During the summer pre-season period, Shakhtar held a training camp in Germany, where they had five friendly games. Defender David Khocholava and midfielder Ivan Petryak have joined the team, as early as on Saturday they may wel debut for Shakhtar in competitive games. Upon returning to Ukraine, the team trained at the training base of Sviatoshyn. The key summer change at Dynamo is Oleksandr Khatskevych as head coach. The Kyivans held a training camp in Austria, having six clubs as their opponents in friendly games. We also note that Oleh Gusev, Junior Moraes, Dmytro Khlebas, Artem Kravets and Dieumerci Mbokani are on the Dynamo roster this new season. Just after their return from the training camp, the White-and-Blues announced signing a Polish defender Tomasz Kedziora. The teams had 9 meetings and claimed two wins each in normal time. The goal difference is 11-11. Five meetings ended in a draw: the winners were determined in the penalty shoot-out, with the balance tipping in Dynamo’s favour 3-2. A year ago, the match was also held in Odesa. In the 58th minute, the Miners opened the scoring: Marlos fed Fred, who beat Antunes to send it into the far corner. The Kyivites responded with a dangerous shot by Sydorchuk, equalising ten minutes away from time, with Vida firing it home after a corner kick. As a result, the teams had to have a penalty shoot-out, with the Lady Luck shining upon Dynamo. The Donetsk team will have their 50th game with Paulo Fonseca at the helm. The Super Cup meeting is taking place in Odesa for the third consecutive year. 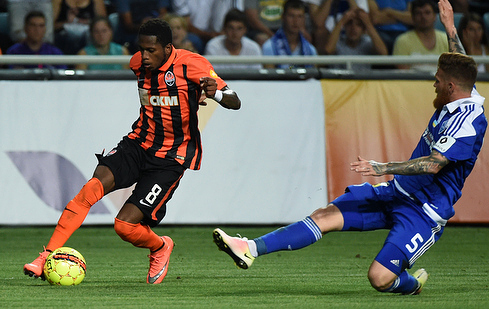 Shakhtar are seven-time cup winners, Dynamo won it six times.